1. Download PDC application file (*.APK) using link Click Here from Product & Pricing web page. Use your Personal Computer (PC) with Internet Explorer for windows operating system (OS) . (Please do not direct download the APK file from your hand phone). 2. This will download compress APK zip file. 3. Unzip the APK zip file. 4. Copy *.APK file from your PC directory and paste to your smart phone storage directory. 5. Run the PDC application on your android phone. 6. Register your name and phone number using Register User of PDC. 7. Send your personal registration details for verification. 8. Once verification completed, you are allowed to use the trial version of PDC. 9. 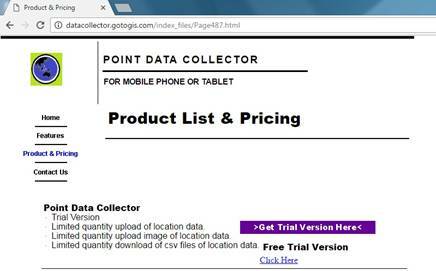 Add your first location data using Add New Location function of PDC. 10. Apply for additional data volumes to upload more location data.